Best Stainless is a leading stainless steel distributor to the pump manufacturing industry. 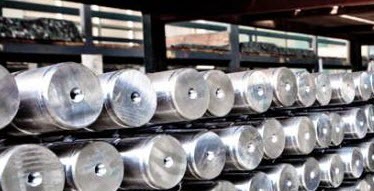 Our comprehensive inventory includes pump shaft quality bars in the most common grades and sizes stocked for prompt shipment. With long lengths ranging from 20’-26’ R/L we can accommodate most applications. We offer diameters from ¾” to 6” in 1/16” increments in precision ground and polished condition. For non-standard sizes or tolerances we offer custom centerless ground shafts. We also stock rough turned and oversized bar stock for use in multi-step shafts used in such applications are boiler feed pumps. Round or hollow bar can be supplied to be machined into shaft sleeves. Key stock is available in cold-finished square and rectangular bars. Pipe and tubing products are available for column pipes in vertical pump applications such as irrigation pumps. Best Stainless distributes high quality stainless steel bar stock for your tight tolerance and precision shafting needs. Dimensionally, Pump Shaft Quality (PSQ) is precision shafting, whereas the OD tolerance, ovality, straightness and surface finish are all enhanced through supplemental processing to a much tighter tolerances than typical bar stock items. Tighter tolerance shafting, such as precision bearing and sleeve contact areas, is required for smooth operations as well as straighter shafts to minimize vibration while running at higher rpms. Our knowledgeable team works with our customers specific material requirements and industry standards including ASTM, ASME, QQN, and AMS, to choose the right product.